When I saw this New Look dress on the ASOS website, my heart skipped a beat. Stretch jersey, skater shaped and an adorable print made this the perfect every occasion outfit. It's one of those rare dresses which I can shoot in comfortably and then run off to meet people for a fun filled evening straight after and still feel well dressed. I teamed it with my new Tatty Devine Mission Control Ring which Howard brought me as part of my Valentines Day gift. 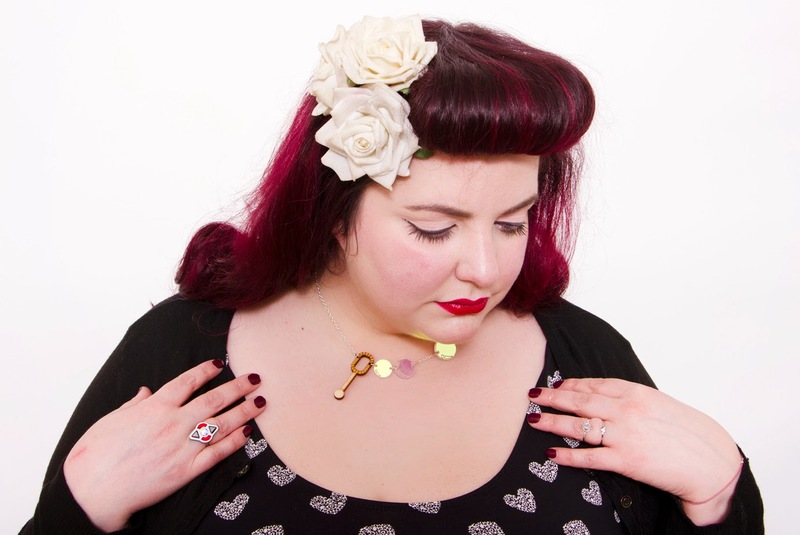 I also wore my Bubble Blower Necklace from Sugar & Vice along with some white roses from Pearls & Swine. Dress: New Look Inspire Heart Print Skater Dress via ASOS. Necklace: Bubble Blower Necklace from Sugar & Vice. Tights: Naturally Close Opaque Tights from Fashion World. Mission Control Ring: Tatty Devine. Belt: Vintage Look Waist Belt from ASOS. The dress had its first outing on a lovely, chilly Saturday where Howard and I wandered through London with no real agenda. We started out in Scooters, one of my favourite cafés in London with its mixture of friendly cats and thick, almost mousse like hot chocolate. We played a few rounds of a cardgame called Coloretto before walking along the river, through to Covent Garden and then to China Town. I can already tell that this is one of those dresses which I am going to live in come Spring!